As far as I know, local contractors have never been in the habit of sending out preliminary lien notices. In the past, many subs and suppliers have been fortunate to work with people they have done business with before, but with today’s shortage of manpower and many new companies popping up, suppliers and subs are doing work with some new companies, and many are from out of the area. There seem to be more and more issues with non-payment of work, and subs and suppliers are not being paid. We have written several columns on preliminary, 20 day notices, and, based on what is taking place with growth and building, it is important to share this information again. Keep in mind, this information is not intended to be all inclusive of the law of mechanic liens in Arizona, but does contain some basic information. First of all, do not panic. You have received a preliminary, 20-day notice in the mail; this is not a lien. Rather, it is a notice that a subcontractor or supplier that your general contractor provided — or will be providing — goods and services to improve your property and could file a lien if they are not ultimately paid. If the subcontractor or supplier is not paid, you will receive additional documents. The later document is called a “mechanic’s lien.” And if payment is not made to contractor or supplier after receipt of these additional documents, the contractor or supplier could institute legal proceedings to foreclose on the lien. But, that is way down the road. The preliminary, 20-day notice is not recorded but only allows the contractor to begin the process. Mechanic’s lien law is, at best, complicated and confusing, and there are risks involved for homeowners. You can take steps to avoid these problems by preparing for the possibility of a lien and employing safeguards to protect you. A mechanics lien is a “hold” for a potential future claim against your property that, if unpaid, allows a foreclosure action, forcing the sale of your home to satisfy any project debts. A mechanic’s lien is a “cloud” on the title to the property that can affect the homeowner’s ability to borrow against or sell the property. Receipt of a 20-day notice allows you to track who has a potential claim against your property. Subcontractors and suppliers must provide you with this notice to maintain their right to file and pursue a lien. If they do not provide you with the notice, they lose the right to file a lien. A subcontractor or supplier can give you the 20-day notice before delivering supplies or starting work and up to 20 days after delivering supplies or starting work. Watch the timing. If the notice is later, the subcontractor or supplier is only entitled to foreclose a lien to recover payments owed 20 days before receipt of the notice and anytime thereafter. Keep track of any 20-Day Notices and make sure you are aware of who can file a lien against your property. Your best protection as a homeowner is to be certain you require and get from the contractor lien releases, both conditional and unconditional waiver and releases on progress payments and final payments. If you have questions or would like copies of the releases, we will be happy to assist. It is important to obtain conditional and unconditional releases for progress payments/partial and final payments. The prime contractor has a direct, contractual agreement with the homeowner. If the contractor isn’t paid, he or she can sue on the contract. But subcontractors, workers and suppliers don’t have a contract with the homeowner. A problem can occur when the homeowner pays the prime contractor for all or some of the work, but the prime contractor fails to pay the laborers, subcontractors, and materials suppliers that were hired to do portions of the job. Again, obtain conditional and unconditional releases for partial and final payments. You can help protect yourself from unwarranted liens by carefully selecting your contractor and responsibly managing your construction project. Thoroughly check your prime contractor’s business and professional work before you sign a contract; hire only licensed contractors and check the contractor’s license status. Make sure your contractor hires only licensed subcontractors and be sure to check their licenses, too. YCCA hopes you find this information valuable. Please call if you have any questions. Not a week goes by when I do not receive calls from contractors near and far looking for employees. Not a week goes by when I do not receive calls from homeowners, indicating they have executed a contract for a home project; however, they are seeking another contractor who can get them on “the schedule” sooner than later. 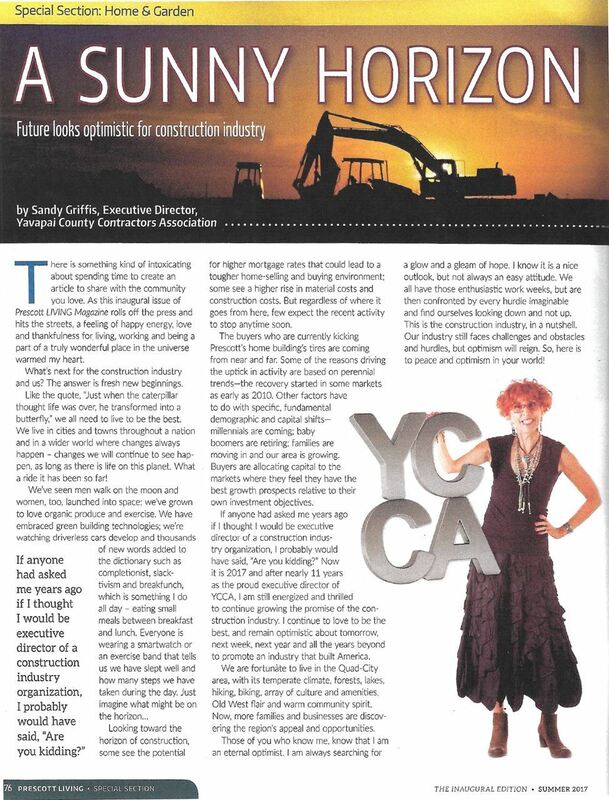 Construction in Yavapai County is ranked as the fifth-largest industry and the third top growing industry. Our industry is not alone in seeking employees. Every business, from banks to newspapers, to radio stations, health care, police and fire, cities and towns, grocery stores — and the list goes on — is in desperate need of good, hard-working employees. The industry that I love most is struggling. Construction is short of labor, so consequently projects are scheduled three, four, five and even six months out. I am writing our column this week to the homeowner. Please understand that the labor shortage has affected our residential and commercial construction and probably will for some time. Just ask any of our construction companies from plumbers to drywall installers to electricians to landscapers to tile and flooring; they all say they cannot find the manpower to handle the surge of homes, remodeling projects landscaping installations, weed removal, paver installations, deck repairs, painting, window replacements, etc. Believe me, Yavapai County is not special. This is a problem felt across the U.S. More and more of our industry partners are seeing more delays as they wait for crews to get to jobs. We do not have enough workers to get the job done. With fewer workers, contractors are becoming wary of signing new work contracts, especially with the workforce issues creating an uncertainly with completion dates and/or a start date, both of which are moving targets. With the promise of new construction jobs continuing to grow, homeowners please understand that with the labor shortage it is tough for our local contractors to keep up with all the demands on them. So if I can say one thing, please be patient. I’m afraid it’s going to get worse before it gets better. Our local jurisdictions are on track to record a high number of permits due to the accelerated permit activity, and of course delays are occurring in issuing permits and homeowners and builders are experiencing delays in starting projects. As you can see, construction delays are plaguing everyone in the industry section. So again, please be patient. Because construction practically came to a halt during and after the height of the downturn, the lack of qualified workers wasn’t noticeable at first. But now that we’re back to building at top capacity, project delays are a serious issue in construction business. Not only do they directly impact current work from the construction companies, but they indirectly affect future projects as everything gets pushed. Material suppliers are overbooked and can’t manufacture and deliver product fast enough. Our contractors are scrambling to catch up without sacrificing quality. Please be patient. 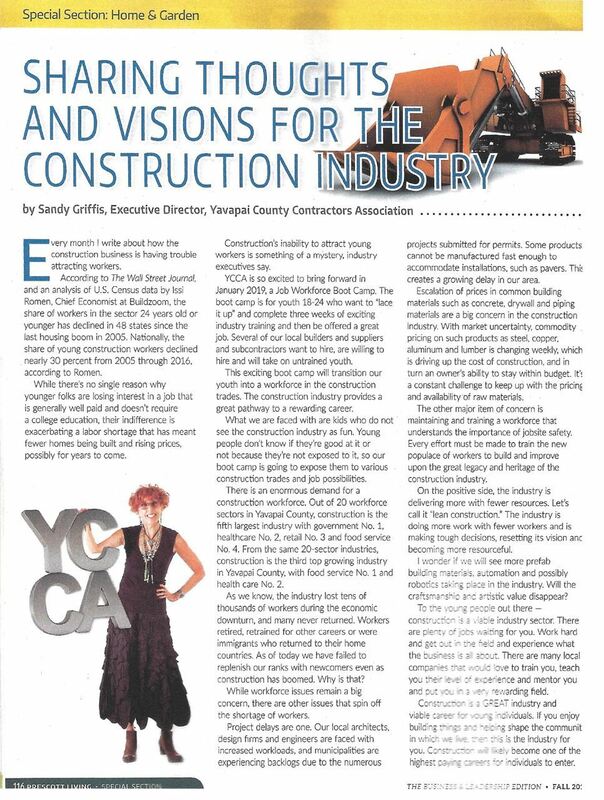 It is important to understand the construction workforce issues and understand that our industry is working as hard as it can to take care of your project and to deliver a good quality project. Contractors would love to swoop in and save the day; however, they can’t. They simply don’t have the manpower. Construction workers have become an increasingly rare and precious commodity. The shortage of workers is dramatically slowing down projects, so again I repeat, homeowners please be patient. I want to close by saying being patient is often easier said than done. Getting through the day can be hard enough knowing you are desperately waiting for that landscaping project which now has been delayed “again” and then it is finally scheduled and then the contractors workers do not show up or called in sick, or the material delivery did not arrive. So guess what — you receive a call saying “I am sorry we cannot start your job today.” Believe me, these contractors do not want to call you and tell you your project is delayed. Being patient is hard, but remember being patient makes people feel good and paves the way for good relationships.